Gmail doesn’t include a way to strike out text but it includes style setting, font color, bold and underline. It doesn’t mean its is incompatible. You already may found the way to do but if you are seeking for some easiest ways , then this article is for you. Strikethrough is a horizontal line goes through the text but the text can be read. It is a typographical presentation. Gmail doesn’t include a strikeout text, it doesn’t mean that it’s incompatible. Using another program on your computer to create strikethrough text and then paste it into your email. Step 1: Open a Microsoft Word and write the text that you want to strike through. Select it and click the Strikethrough icon shown in the Font section. Step 2: Press Ctrl+C to copy the selected text from word. Place the cursor in your Gmail and press Ctrl+V to paste the copied text. You can install add-ons or extensions in chrome or Firefox. It’s the best thing about it and that’s very helpful to add some extra features. The extension is available onweb, that adds “Gmail Strikethrough” option. For Chrome Browser – The Strikethrough extension is available and you can download it from the chrome web store. To use this extension you need to reload the Gmail Tab. Select the text that you want to Strikethrough. Press Right-Click on it and go to Strikethrough etc. -> Strikethrough -> “short strikethrough option”. For Firefox browser – The strikethrough extension is available for Gmail. 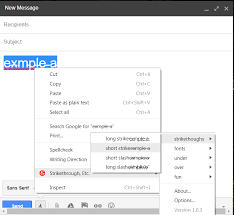 The extension adds “S” option in the Gmail compose box so that you can directly use it like other text formatting tools. Method 3: Using Google Docs. By opening the “Google Docs” site and log in through your Gmail account. By clicking on the “+” icon to open a new document. Now, you can write whatever you want and then select it. After Selecting the text, go to Format > text > Strikethrough. Or you can press Alt+Shift+5 simultaneously. These are the methods used “Strikethrough” text in Gmail. The third method is much fast to use, but we prefer the first method. Installing the extension for the “Gmail Strikethrough” isn’t a good idea.